Proportion-Air built its reputation on electronically controlled high flow valves capable of very high flow rates. 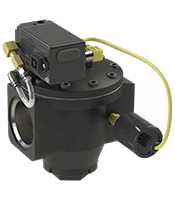 Utilizing our industry leading downstream pressure transducer technology, Proportion-Air electronic pressure regulators are used to pilot operate the mechanical volume booster which is the best fit to your application. assembly produces a high flow electronically controlled pressure package. By adding the transducer, the mechanical inaccuracies & hysteresis of the volume booster is compensated for and accuracy of ±0.2% is achieved without regulator droop. The downstream pressure transducer feeds an electronic control signal back to the electronic high flow valve (pilot) so that the control loop is closed around your actual output pressure. This allows us to overcome any mechanical inaccuracies and hysteresis issues inherit in the mechanical regulator we are piloting. Understanding the flow required for your application is critical to implementing the correct product in your process. If you are unsure of your flow rates, no problem! Our application engineers are great at asking the right questions and gathering the required information to calculate the flow you require and recommend the best high flow valves to meet your needs. Over-sizing flow rates is (generally) not a problem. But under sizing the flow rates can mean the difference between success and failure. If your high flow valves do not flow enough for your process, speed and pressure is lost downstream. At Proportion-Air, we have a multitude of products and methods for achieving a broad range of flows and pressures – way more than we can advertise on our website. So please give us a call and let us help you with your application.